Start by making the flatbread dough. Mix the flour in a bowl along with salt and mustard seeds, mix together. Add the oil and warm water and mix until it forms a smooth dough. Knead the dough for 3-4 minutes. Cover with oiled cling film and let it rest for 30 minutes. Preheat the oven 200°C / 400°F / Gas Mark 6. Lightly grease a flat baking tray and place in the oven. Divide the dough into 2 balls and on a floured surface roll out two oblong shapes (they can look rustic). Transfer to the hot baking tray and cook for 4 minutes on each side or until golden brown. On each flatbread add the English mustard and spread evenly, leaving an inch around the crust. Add in two of the green chillies with the grated cheese and give it a good mix. Sprinkle the cheese and green chilli evenly over the flatbreads and then place under the grill for 1-2 minutes until the cheese has melted. Fry 4 eggs in a pan, you might want to do two at a time instead of overcrowding the pan. 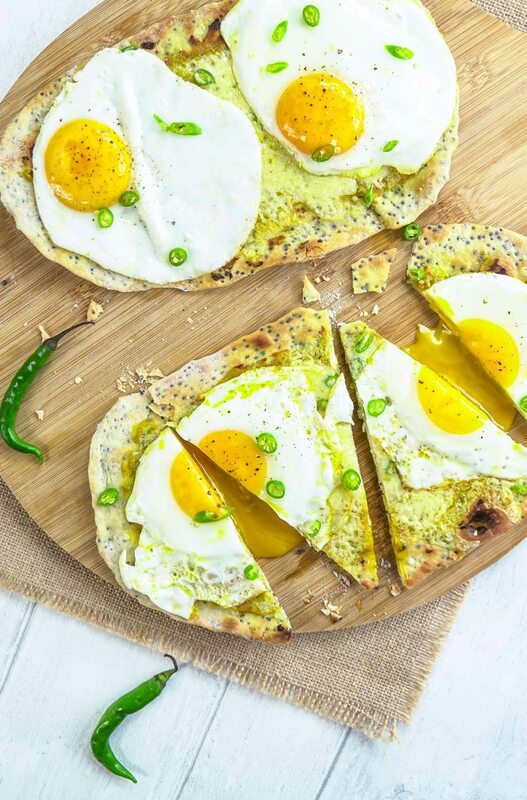 Once the eggs are cooked, place two on each flatbread and sprinkle with the rest of the green chilli.